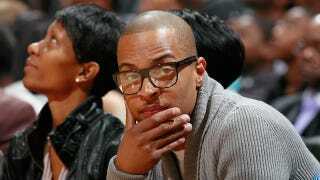 If you weren't planning on watching tonight's Heat-Hawks game, you should be now, because according to a press release that was sent out this morning, rapper T.I. will be doing color commentary for at least two quarters during the game. With music, acting, producing, two novels and fashion under his belt, Atlanta native, T.I. will soon add NBA color commentator to his resume. When the Atlanta Hawks take on the Miami Heat Friday night at Philips Arena, T.I. will join longtime SportSouth commentator Bob Rathbun and former Atlanta Hawk Duane Ferrell as contributing sports analyst. During his debut, T.I. will participate in live game day coverage on SportSouth during the first two quarters of the Atlanta Hawks vs. Miami Heat game airing at 7:30 p.m. I never knew that T.I. 's résumé was so robust. Personally, I will always remember him for his role in ATL, a film that included a lot of roller skating and a a scene in which T.I. throws a wad of money right in Big Boi's face. That movie was awesome.